Amazon.com -- It was was almost impossible to find the ISBN number or the publication date on this site. Even with the used books, the publication date was not listed -- why would any student want to buy a book with an old publication date, especially to study for a 2009 Advanced Placement Test. BarnesAndNoble.com - this site contained the ISBN number 97815676556602 and the Publication date. This site also allowed you to find the book at their stores, unfortunately, they were sold out. Google Shopping -- http://www.google.com/products?q=9781567656602&hl=en&show=dd - This site listed the range of prices from $23.00 to $208.00 not including shipping but did not include the publication date of the book. It did list the publisher AMSCO School Publications Incorporated (2004) which I subsequently used to find the publisher website. It listed the range of prices form $23. 00 to $208.00. CheapBooks.com -- This site was suggested by my daughter, but was not useful. 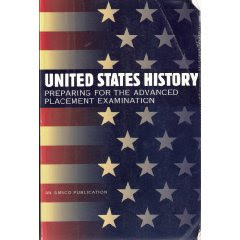 I ended up buying this book direct from the Publisher at the site below for $17.00 plus shipping. In the end, with all the advancements made on the Internet such as Web 2.0, the best deal I could find for buying a book on the Internet was direct from the Publisher's website. It required finding the ISBN number, finding publisher's name and ordering it over the phone. It sounds like even with Web 2.0, Book Shopping 2.0 or Amazon 2.0, we're still not quite there yet.